Look appealing and camera-ready with full lashes and brows that frame the eyes. Use Namskara Organic Castor Oil USDA Certified to get naturally beautiful eyelashes and eyebrows. 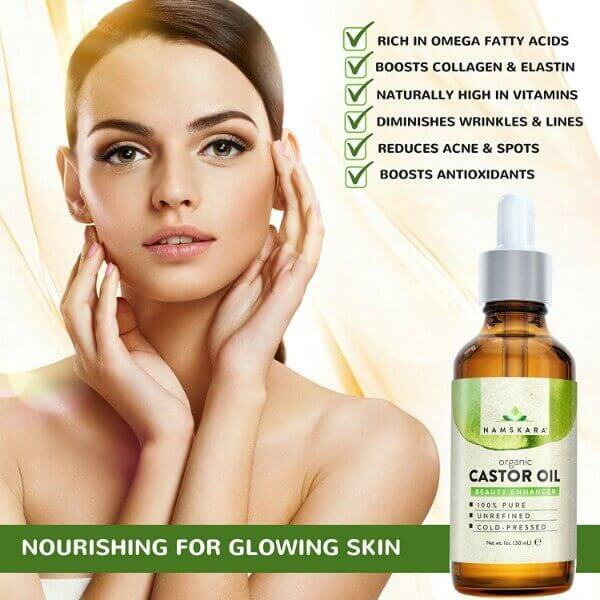 This pure and unrefined oil has anti-aging benefits that prevent the development of signs of skin aging. Discover its great benefits for skin and hair care here. 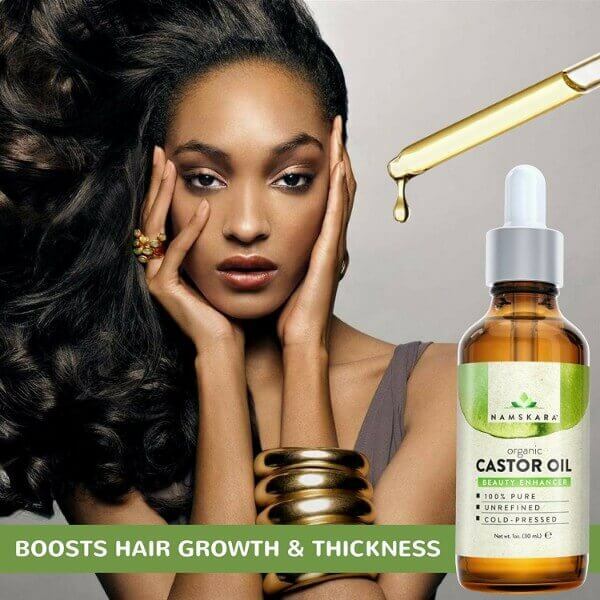 Promote healthy hair with this organic castor oil. 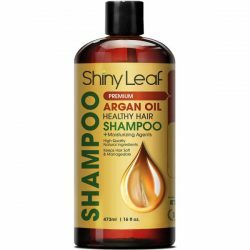 It helps prevent hair loss and gives hair a thick and lustrous appearance. It is rich in vitamins and proteins that are good for hair. Mix castor oil with hair products or use it to treat dry and damaged hair. 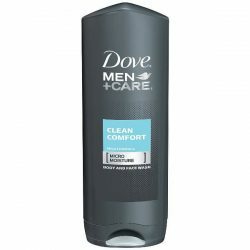 It makes hair soft and bouncy after use. 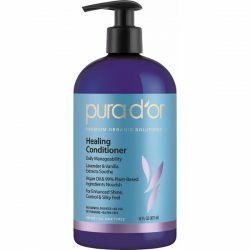 Get healthy and lustrous hair with regular use! Thinning brows is another issue that castor oil can treat. 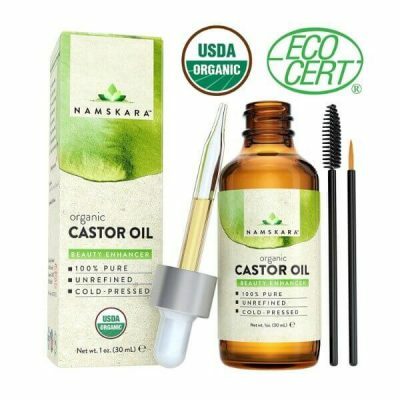 Namskara organic castor oil helps improve the appearance of eyebrows and eyelashes by giving it extra shine and volume. 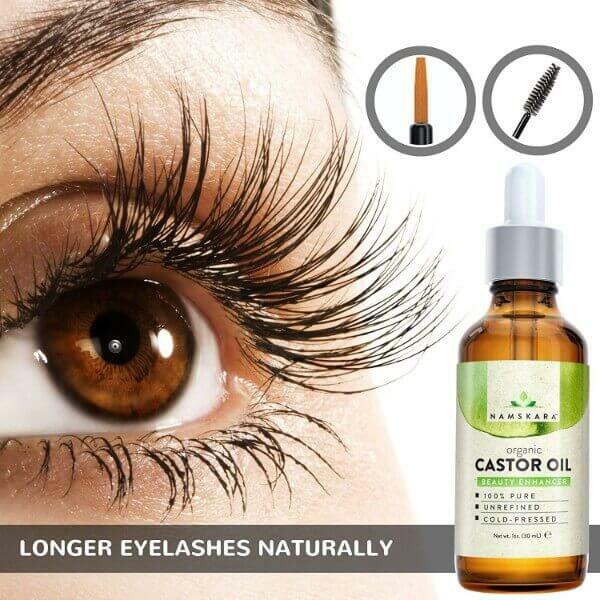 Castor oil is rich in vitamin E and other minerals that work as a serum to improve the length of the lashes. Ditch brow liners for this all-natural solution for thinning brows or falling lashes. The product comes with applicators for easy and mess-free use of castor oil. Apply it every night to get noticeable results in a few weeks. 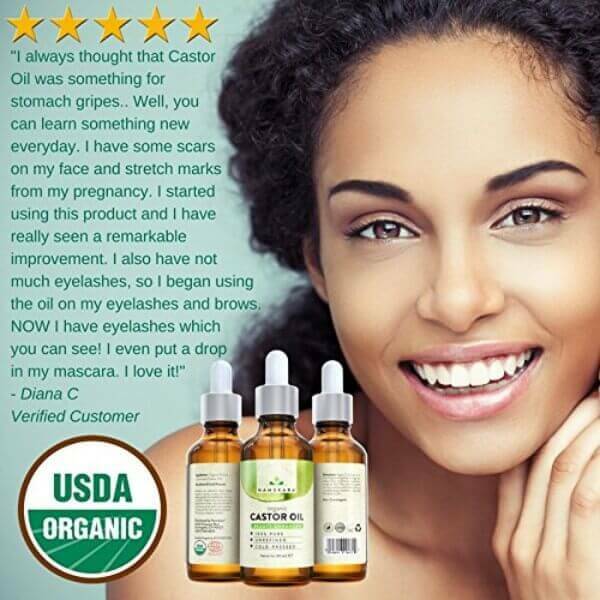 Castor oil also has therapeutic effects on the skin. It soothes inflammation and kills bacteria to prevent them from spreading. 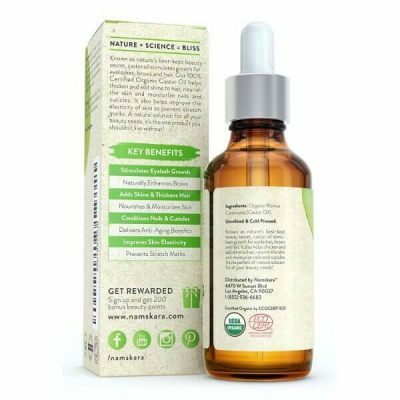 Apply it to acne, dry areas of the body, or to affected areas to alleviate their symptoms. It improves skin elasticity as well to give it a smoother appearance. This fades stretch marks and other blemishes! 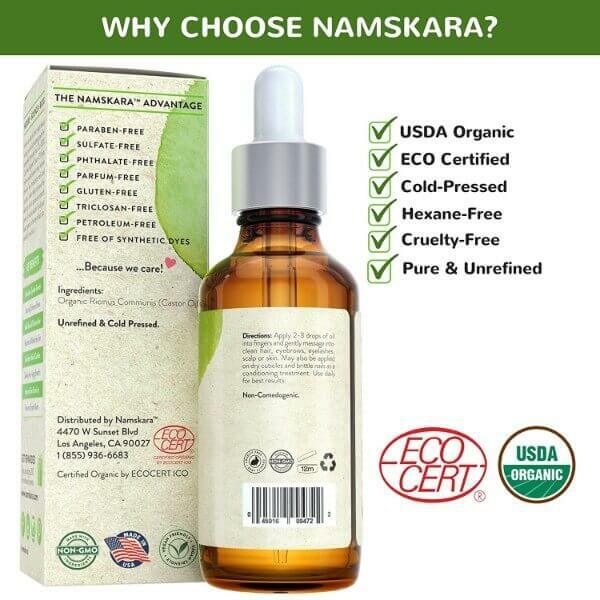 Namskara Organic Castor Oil USDA Certified has other uses for body care. Use it to strengthen nails or to hydrate the skin and help it recover from dryness. Get this product and see its great benefits that improve the health of the body. Comes with 2 applicators for mess-free use of castor oil. Made from pure castor oil and does not contain fillers. Contains a concentration of vitamins and proteins that prevent hair loss. 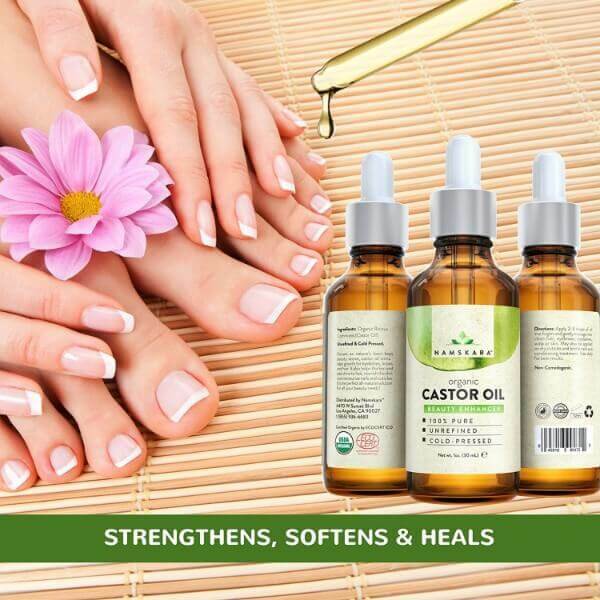 Strengthens nails and conditions cuticles. Promotes growth of long and thick lashes and brows. Treats dry and dull hair to make it shiny and soft. Reduces appearance of blemishes and signs of skin aging. Rich in vitamins and minerals that protects skin and hair from damage. For external use only. Apply daily to get noticeable results in a few weeks. To use the product on skin or hair, mix with body care products for extra moisture and nourishment. Apply 2-3 drops of oil to fingers and massage into affected area for hair loss, dry skin, blemishes, and acne. Do the same for conditioning nails. To apply to lashes, take the applicator and dip in the bottle. Slide the applicator on the edge of the bottle to remove excess oil. To use on eyelashes, use the liner. Apply from the roots of the lashes starting from the inner eyelids and going outwards. Do this on the upper area first before applying at the bottom eyelid. Brush the lashes from the roots to the tips after. Apply on eyebrows by using the mascara wand. It ensures that the oil penetrates the skin beneath. Dip in the bottle and remove excess oil. Follow the growth of hair and brush from the inside going outwards.